Cast iron is a durable alloy comprised of iron and carbon. 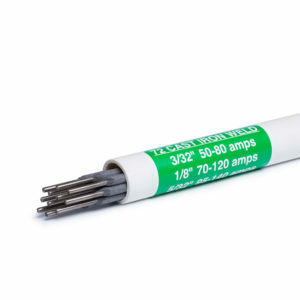 Whether you’re working with gray cast iron, malleable cast iron, or nodular cast iron, Muggy Weld 77 electrode can make the repair–simply, quickly, and without pre-heating or special cooling procedures. 77 can also be used as a TIG rod. Dave, a MuggyWeld customer, owned a cast iron vice with a broken base. After inspecting the part, Mike determined that 77 electrode was perfect for the job. While the repair shown is a cracked piece of low-quality cast iron, 77 is an effective welding solution for all types of cast iron, and a variety of parts: diesel engines, pump housings, exhaust manifolds, ductile iron pipe, sewer lines, cylinder heads, motor blocks, transmission cases, valve seals, bus pressure plates, carburetors, and retractable wheels. 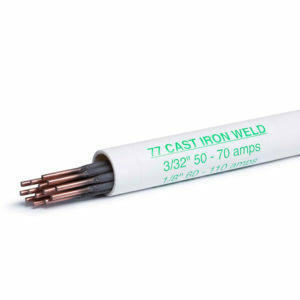 Heat-affected (burnt) cast iron may require a root pass with 72 electrode, as some heat affected cast iron is difficult to anchor into. Examples are cast iron exhaust manifolds and cast iron woodstoves.